Washburn and Kissâ€™ guitar player Paul Stanley have joined again to design new models of its signature series, the new models belong to the Washburn Paul Stanley Preacher Signature brand, have a single cut-away Les Paul-like shape design and there are 4 different models, PS9200, PS9000, PS7200 and PS7000. The Washburn Paul Stanley Preacher Signature PS9200 and PS9000 have similar features, both of them feature mahogany body and neck, 18:1 Grover tuners, ebony/rosewood (PS92000 and PS9000, respectively) fingerboard, 22 jumbo frets, 24.75? scale length, Tone Pros bridge with stop tailpiece, 2 Seymour Duncan Pearly Gates humbucker pickups, 3-way pickup switch and 2 volume and 2 tone controls. 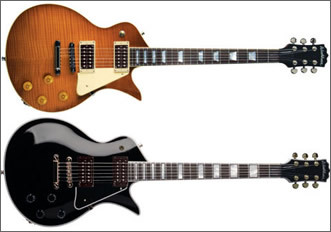 The PS9200 model, the one used by Paul Stanley, is available in black and white finishes and has a $3,899.90 list price; while the PS9000 is available in gold top and honey-burst flame maple finishes but its list price is not announced yet. The other models, Washburn Paul Stanley Preacher Signature PS7200 and PS7000, also share some features, mahogany body and neck, Buzz Feiten Tuning System, 18:1 Grover tuners, ebony/rosewood (PS72000 and PS7000, respectively) fingerboard, 22 jumbo frets, 24.75? scale length, Tune-o-matic bridge with stop tailpiece, 2 Egnater humbucker pickups, 3-way pickup switch and 2 volume and 2 tone controls. The PS7200 model is only available in black finish and its list price is $1,299.90; while the PS7000 model is available in honeyburst finish and its list price is $1,249.90. All the models of the Washburn Paul Stanley Preacher Signature series include a guitar case and will be soon available.